The Hudson County Improvement Authority was selected by the NJ Association of Conservation Districts for its 2015 Outstanding Developer award for the construction of the 9-hole Skyway Golf Course on top of a former landfill. This project increased public access to sixty-five acres of previously unused and inaccessible public property by the creation of the first (and only) public golf course in Hudson County. A public waterfront walkway runs along the west edge of the golf course. The design of the course incorporates native vegetation and a tidal pond that will support the recreated wetlands, transition area, and golf course. The design engineers, PS&S, and developer, the Hudson County Improvement Authority, worked cooperatively with the Hudson Essex Passaic SCD throughout all phases of the six-year project including dredging, surcharging, grading, construction and final stabilization. “I want people to understand that our community does not exist as an island, but is instead inextricably connected not only to the Passaic watershed and across our bio-region, but indeed to all of planet Earth,” said Gray Russell, the Montclair Sustainability Officer. Gray is changing the world around him in important ways and on a grand scale. He is such an unassuming person that there is a lot that might surprise one about Gray’s accomplishments in his 25-year career as an environmental professional. But to those people who know and work with him, he is definitely the resident expert and a man of action for all things sustainable. Montclair is a “town of firsts” for sustainability initiatives, thanks to his vision. For the past 14 years, Gray has served as the sustainability officer for Montclair. He is the municipal liaison to the Montclair Environmental Commission, with whom he co-authored the Sustainable Montclair Planning Guide in 2002. Gray is co-chair of the Essex County Environmental Commission and is a Hudson/Essex/Passaic County soil conservation district supervisor. He is a Certified Recycling Professional, and serves on the Board of Directors of the Association of New Jersey Recyclers (ANJR), the Advisory Council for the NJ WasteWise Business Network, the Board of Advisors for Bike & Walk Montclair, the Board of Directors of Rainforest Relief, the Steering Committee for the Sustainable Jersey Essex Hub and a Board Member of the Cornucopia Network of New Jersey. Montclair, located in Essex County, is a diverse and artsy urban suburb with a population of about 40,000. As a fourth-generation resident of Montclair, Gray is a graduate of the public schools. His parents, Graham and Peggy, encouraged him to live life to the fullest and root for the Yankees. He attended Nasson College in Springvale, Maine, and the Université de Caen in Normandy, France, before transferring to the University of New Hampshire. He majored in philosophy, which provided him with a habit for inquiry and the sense of the interconnection of all things. “I love to learn. I’m thankful for all that I have been exposed to in my life; I think it helps me to better understand people and the issues that impact our world,” Gray said. After college, Gray went to London and took a job at Ronnie Scott’s Jazz Club, one of the oldest jazz clubs in the world located in London’s west end. After a year of working at the club, being exposed to people and music from around the world, he left with invaluable life experience and a new career goal. He returned home to study audio recording. With a diploma in hand, he launched into an amazing 15-year career in the music business as an audio recording engineer and music producer at the legendary Record Plant Studios on West 44th Street in Manhattan. Gray suspects that his roots in Montclair tipped the scale for his hiring as the owner of the studio was also a Montclair resident. Gray excelled and worked on almost 100 major label recordings, earning over 50 album credits. 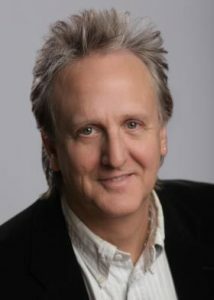 He has been awarded several Recording Industry Association of America Certified Gold and Platinum Records. A few of the artist’s Gray worked with include: Tom Petty, Patti Smith, Bruce Springsteen, Blondie, Aerosmith, Television, Lou Reed, Joan Jett, Miles Davis, The Clash, Kiss and The Go Gos. In 1990, Gray was hired by the New Jersey Environmental Federation/Clean Water Action, the largest environmental coalition in the state. “As I switched from the 12 hour nights in the recording studio to six hour days in the daylight, I had a lot of energy and I think I surprised my co-workers with my enthusiasm,” said Gray. 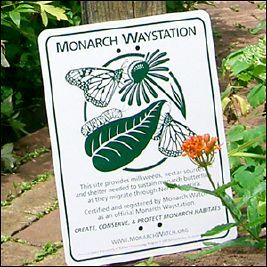 Building on his interest in composting, from 1993 to 2000, he was the manager of the Bronx Green-Up Compost Project at The New York Botanical Garden. Gray served on NYC’s Recycling Advisory Board, advising the City Council, and the Bronx Solid Waste Advisory Board, advising the borough president. He was also the director of the NYC Waste Prevention Program at INFORM, Inc., a national environmental research and advocacy organization in Manhattan. Under Gray’s leadership, Montclair was a 2009-certified inaugural Sustainable Jersey community, and achieved re-certification at the bronze-level in 2013. You can read the complete Montclair Township Sustainable Jersey Certification Report to review all of the actions that Montclair completed for certification. In 2010, the township was designated a “Climate Showcase Community” by the US Environmental Protection Agency and was awarded a competitive grant to help quantify and reduce the community’s carbon footprint. In 2010, Montclair received a Sustainable Jersey Small Grant of $25,000 for the installation of public charging stations for electric vehicles (EVs). Montclair was the first town in the state to install a networked series of public charging stations in the heart of its commercial districts. It provides an innovative, alternative energy technology that expands the mobility of EV drivers. Located in two municipal parking lots – one in the heart of the downtown business district, and one in Upper Montclair’s busy shopping area – the four stations can recharge any pluggable battery-powered cars, including hybrids. In 2014, Montclair was awarded a $20,000 Sustainable Jersey Small Grant to fund a project that again put the township in the “first in the state” category. Montclair, in partnership with the New Jersey Bike & Walk Coalition (NJBWC), unveiled a new bike depot to provide safe, secure, weather-protected storage for bikes, helmets and personal items. The depot reduces vehicle emissions and lowers the carbon footprint; it also encourages residents to adopt a more healthful lifestyle. It holds 24 bikes on two-tiered racks and offers 18 lockers for rent. “Sustainable Jersey grants are important because they seed innovative projects that need to be implemented first with a grant to get them to catch on. For example, this bike depot will serve as a model for other NJ Transit train stations,” said Gray. Gray, working on his next “first,” went before the Town Council in May to propose the concept of the municipality locking in a fixed bulk rate of electricity for all ratepayers, with the goal of achieving financial savings and a higher “green” energy component. 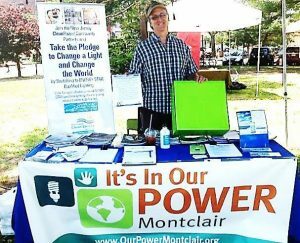 Montclair already participates in a similar program with municipalities in Essex and Hudson counties to purchase greener, less expensive energy for municipal properties. He said the next step will be to get council approval to proceed with the plan, which would include a public education initiative, the drafting of a Request for Proposals and ultimately, determining whether or not to enter into an agreement. By implementing an R-GEA program, community participants gain access to renewable energy at a lower cost, with better consumer protection, and with more convenience than if they attempted to purchase a similar product on their own. The municipality is therefore providing a service to the community, while also advancing key sustainable energy goals in a powerful way. Gray has lectured on the subjects of environment and sustainability at Cornell University, Princeton University, Rutgers University and Montclair State University. He teaches a Sustainable Management class for New Jersey Department of Environmental Protection’s Recycling Certification Series at Cook College. In 2014, he lectured on “Sustainable Communities” at classes for three separate courses on Sustainability at Montclair State University, Bloomfield College and Seton Hall University. Gray estimates he has trained more than 1,000 people on composting over the 30 years he has been speaking to groups and teaching courses. In fact, the number is most likely higher because he was featured on various radio and TV programs and did composting demonstrations on Martha Stewart “Living” (CBS-TV), “Live” with Regis & Kathy Lee (ABC-TV) and The Home and Garden Network. In 1992, Gray participated in The Global Forum at the United Nations Conference on Environment and Development (UNCED), also known as The Earth Summit in Rio de Janeiro, Brazil. In 1997 he travelled to Haiti to train activists to compost, to improve their soil and reduce waste. In 2005, he spent a week near the Arctic Circle, working with a scientific research team from the University of Alberta measuring the effects of climate change on the permafrost around Hudson Bay. In 2014, he spent several days in the Brazilian Amazon, exploring Earth’s largest rainforest. In 2006, Gray was awarded a Fellowship Grant by the British Council and the Foreign and Commonwealth Office; he spent three months in the UK studying Energy Efficiency at the Institute of Energy & Sustainable Development, DeMontfort University, Leicester, England. He was then selected by The Climate Project to be trained by former Vice President Al Gore and a team of scientists and educators to conduct public presentations on the planetary crisis of global warming, its causes and solutions, and the many opportunities it presents. Gray subsequently gave 30 presentations on the reality of climate change to almost 2,500 people. He re-trained twice with Mr. Gore in Nashville. Gray is working with the Association of New Jersey Recyclers on new legislation for food waste recycling. Gray said, “It’s the holy grail of garbage to remove food waste which is wet, heavy and stinks. We’re now looking at composting or anaerobic digestion and have proposed new legislation. Food waste makes up 20-25% of the garbage going to NJ landfills. That makes it the next logical choice to add to the list of stuff that needs to be recycled statewide.” The proposed legislation, the Food Waste Recycling Act, A4397, would require businesses and institutions in New Jersey generating 104 tons a year of food waste to send it to a composting or recycling facility rather than a landfill or incinerator. In his free time, Gray likes to spend time with family including his two grandsons and he has an upcoming trip to France planned with Linda. Gray is also an avid soccer fan; he attends Red Bulls games in Harrison and has been to five World Cups around the world. 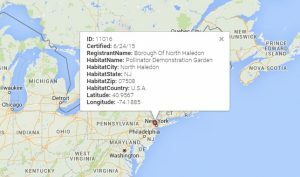 The Pollinator Garden installed in conjunction with NJACD & the North Haledon Green Team has achieved Monarch Waystation status.